With the markets trading at near record levels, everyone is looking for stocks that have both performed well in recent months, and have the potential to build on their recent gains moving forward. Valuations are becoming a concern for investors, as the recent bull market has pushed stock valuations a bit high, but recent tax reform, and overall strength in the overall economy should help companies continue to grow profits, and allow stocks to continue moving in the right direction. With the market near its highs, most stocks are showing strong technical trends, but in order to find stocks with the greatest chances of additional gains, you need to make sure that the underlying fundamentals support future growth and appreciation. 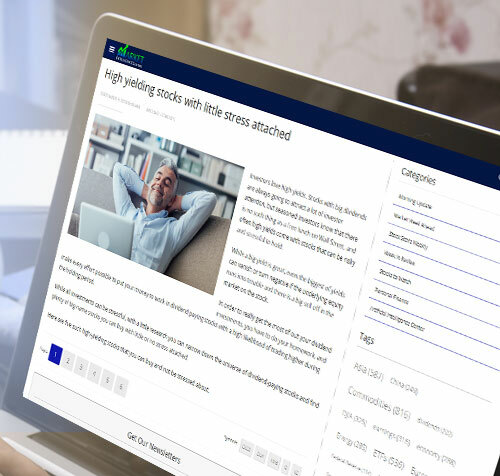 The new stock screening tool from InvestorsObserver, The Stock Score Report, is valuable because it takes into consideration not only short and long term technical trends, but also the underlying fundamentals. If a stock can score high both technically and fundamentally, it has a much higher chance of continuing to trend higher and build on any recent gains. Here are five hot stocks that have what it takes to move higher in the months ahead. Home goods retailer At Home Group (HOME) has been a top ranking stock on InvestorsObserver’s Stock Score Report for some time, and the first time we looked at the stock was back on December 7, when shares were trading at $25.28, with an overall ranking of 89. Since that time, the stock has appreciated to its current price of $31.23, for a gain of 23.5%. HOME currently gets an overall ranking of 87 from InvestorsObserver’s Stock Score Report. With the recent run up in the stock, it now appears to be priced for perfection, with a P/E of 51.8. The strong housing market has kept housing related stocks moving in the right direction, and analysts expect to see more upside from HOME moving forward, with an average price target of $34.17. The valuation could become a problem, but with earnings expected to rise by 35.6% during the current year, and by 32.5% per annum over the next five years, it is easy to see why analysts are willing to set an average price target that suggests another 9.4% upside potential from the current level. Video game maker Electronic Arts (EA) jumped 8% following its just released fiscal third-quarter numbers. The company posted earnings of $2.22 versus the consensus $2.18. The better than expected profit number pushed shares higher, and the stock hit a new record high on the results. EA currently gets an overall ranking of 88 from InvestorsObserver’s Stock Score Report. Considering the stock is currently at a record high, it is not surprising that it gets a perfect ranking of 100 for its short-term technicals. Good long-term technical and fundamental scores make EA an attractive buy at the current time. The stock has a P/E of 33.8, which is a bit high, but analysts forecast the company will grow earnings by 17.1% next year, and by 14.8% per annum over the next five years. The strong growth estimates should allow shares to build on recent gains. EA is currently trading at $128.45 versus an average price target of $129.12, but with the recent earnings report being just released, you can expect to see analysts start to ratchet up their price targets in the near future to allow the stock to trend higher. 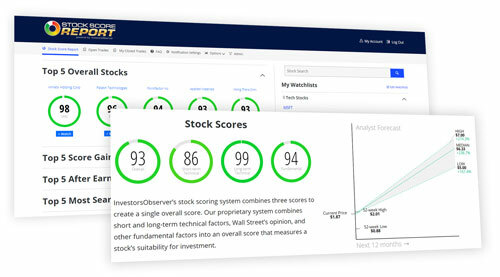 Medifast (MED) is another stock that has consistently appeared among the top ranked stocks in InvestorsObserver’s Stock Score Report, and it remains there with an overall ranking of 87 at the current time. We first noticed the stock in the ranking system back on December 14, with an overall ranking of 94 at that time. MED was trading at $71.53 at that time, and has since fallen 2.8% to $69.52. Analysts remain upbeat, with an average price target of $89.00 on the stock, and it currently gets an overall ranking of 87 on InvestorsObserver’s Stock Score Report. The stock hit resistance in mid-December, and has been trending sideways over the last six weeks. The resistance could be a result of a P/E of 34.1, but earnings are expected to rise by 15.0% per annum over the next five years, so shares should be able to trend higher as long as the company is able to hit its future estimates, which is why analysts have such a high price target on the stock. MED will next report earnings on March 8, so I expect the stock to remain range bound ahead of the next report, which will determine which direction the stock trades as we head into the spring months. Improvements in the commodities sector, and in the overall economy has helped drive shares of Steel Dynamics (STLD) higher in recent months, and shares are currently trading just shy of their all-time high at $46.18. We first noticed STLD in the InvestorsObserver’s Stock Score Report on October 25, and at that time the stock was trading at $39.46. Since that time, shares have appreciated 16.8% to $46.11, and analysts have an average price target of $48.90 for the stock, suggesting another 6.0% upside potential. Currently, STLD gets an overall ranking of 75 on InvestorsObserver’s Stock Score Report, with strong long-term and fundamental rankings, and a slightly weaker short-term ranking due to some recent profit taking in the stock. The company reported better than expected numbers on the top and bottom line for its most recent quarter, and analysts forecast 43.2% earnings growth this year, and 16.8% annual earnings growth over the next five years, so the outlook remains bright for the company, and I expect to see another strong year for the stock in 2018. Semiconductor stocks were hot in 2017, and ON Semiconductor (ON) was no exception. The stock rose sharply during the second half of the year. Shares were trading a little below $14 at the start of July, but have since rallied, and the stock is now trading at $24.93. The recent run up has pushed the stock above the $24.03 average price target that analysts have on the stock, but if the company is able to post strong Q4 numbers when it reports earnings on February 5, analysts will likely boost their price targets to allow for more upside. ON currently gets an overall ranking of 87 on InvestorsObserver’s Stock score report, with strong rankings for both technical and fundamental data. Earnings are expected to rise 16.0% over the next year, and by 27.8% per annum over the next five years, which should be enough to drive shares higher. ON has a P/E of 27.1, which is acceptable considering the stock growth estimates, and should allow the stock to continue to build on its recent gains.